The foot is made up of an intricate alliance of 26 bones and 100 muscles, ligaments and tendons. 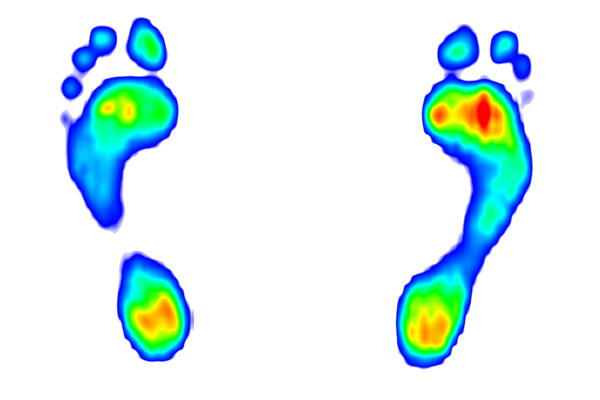 Our feet manage both weight and movement. During movement the body's muscular system provides stability, initiates movement and protects from impact. Of course, if one joint cannot perform its function adequately then it places more demands on the rest of the body to compensate. These problems occur either in their immediate location or in yet another part of the body that is in turn attempting to compensate for the inability to cope. By understanding this process, you can see that your pain or problem may actually be originating from quite another part of the body. Tracing the route of the body's pain and discovering its origin is the task of the expert practitioner. At Somerset Health Practice we have a wealth of understanding and experience of analyzing the body in this way. We know that when we view the body as a complete picture of health, we create an opportunity to reconnect with natural health from the feet up. Our policy is to offer a caring, whole person approach supported by the latest developments and research methods in our field. This means we use state of the art pressure plate and gait analysis software systems to see clearly where joints and feet are functioning poorly. We also use ultrasound for diagnosis and for monitoring treatment progress and we are qualified to supply and fit orthotic inserts for shoes to correct the function of feet. When you consider the curved shape of the foot and understand how movement is transmitted through adjacent areas, it seems amazing that we still make shoes with flat soles rather than contours!